Ernie Hines (singer/songwriter/guitarist) has been a recording artist for well over fifty years. First signing to USA Records, then Stax Records and WeProduce Records. Stax Records went on to release full recordings of his work, including the singles “Help Me Put Out the Flame (In My Heart)” and “A Better World (For Everyone)”. Portions of “Help Me Put Out the Flame (In My Heart)” were later sampled by the rapper Jay-Z on his highest selling album to date. Ernie’s recordings are on the walls of the Stax Museum of American Soul Music in Memphis, TN. Check it out. The Electrified album (now owned by Concord Music Group, Inc.) was reissued – 2009 Universal Classic & Jazz, UMC – Marketed & Distributed by Universal LLC., Japan. And in 2010, (BGP) Funk & Jazz Classics was Marketed & Distributed by Ace Records Ltd., London. Buy it CD or vinyl, wherever music is sold on the World Wide Web; at popular sites & stores. In 2010, LEVI STRAUSS & CO. (Levi.Com) produced in stereo Levi’s Pioneer Sessions (Levi’s Revival Recordings), a large number of the 45 vinyl records that features Ernie Hines and John Legend’s individual recorded performances (A & B sides) of Our Generation. Try and get your hands on a copy of that 45 for your Treasure Troves! Born: Earnest Lee Pickford/Hines (his mother Sophia Idella Pickford; his father, Tommie Lee Hines, a World War II “Purple Heart” recipient), Ernie has done it all from the boy’s glee club and choral music groups in school, to singing in his uncle’s family quartet: from playing semi-pro baseball (Duluth, MN) and quarterback of his high school and college football teams; to performing with local gospel groups in Jackson, MS. Shortly after starting to play the guitar, Ernie and his family moved to Baton Rouge, LA where he began working with a local singing group, the Singing Silvery Clouds, before settling in with his own gospel group, the Scotlandaires, who quickly became a household name after recording a radio jingle for Sunbeam Bread (music arranged by Ernie) a well-known food brand in the city, made by Wolf’s Bakery, the company Ernie was employed by at the time. While living in Baton Rouge, and working with Christian groups across America, Ernie’s musical taste began to evolve; He started to play music in all genres of entertainment, from the Slim Harpo Blues Band to the Joe Valentine’s R&B Pop Band. He played gigs with some of his childhood trendsetters of their day, such as Big Joe Turner, Lowell Fulsom, the Upsetters Band, and Clyde McPhatter. In addition, he did “gigs” with Johnnie Taylor, Roscoe Robinson, and upon the recommendations of a popular local radio Deejay, Alvin “Diggie Doo” Dixon, Ernie became the personal guitarist for L.C. Cooke, the brother of Sam Cooke. During filming of the movie, “Hurry Sundown”, in Baton Rouge, Ernie worked with famed Producer/Director Otto Preminger and music maestro Hugo Montenegro in setting up the musical score for the title song of the movie soundtrack. He also taught actor Robert Hooks to pantomime the guitar for the big closing scene in that movie. 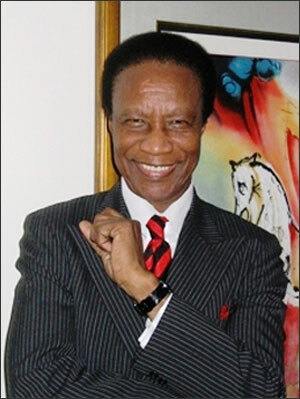 Ernie came to Chicago, IL from Baton Rouge, LA (by way of Jackson, MS), in 1966, after being offered a contract by Wand recording artist, Roscoe Robinson (R&B/Gospel/singer and producer), to record some of the songs he had written and composed. And it was suggested by noted arranger Johnny Pate that he setup his own music publishing company. So, Ernie created Colorful Music Publishing; as well as Baby Blue Records, the label he would record on years later. To his credit, Ernie has penned & composed more than a hundred songs; as a BMI writer. During that same period, Ernie wrote gospel songs that were recorded by the Fantastic Violinaires of Detroit, MI-R&B songs for Little Ben & the Cheers (sons of the famous Norfleet Brothers Quartet of Chicago, IL), and co-wrote songs recorded by Patricia & the Lovelites. A long-time resident of Forest Park, since 1975, Ernie has been a part of the growth of “The Village with The Friendly Smile,” beginning with Mayor Fred Marunde to the presiding Mayor, Anthony Calderone; a member of District 91 School Advisory Board, the F.P. Main Street Redevelopment, and the F.P. Chamber of Commerce. Ernie was a performer at the Centennial Celebration of Forest Park in 2007. A Life Member – “Ernie has paid his dues” – of the C.F.M. (Local 10-208) and the American Federation of Musicians & Canada. Ernie also has credentials in the jewelry business with twenty-one years’ experience as a DCA guild gemologist/Diamontologist. He is GIA certified. In 2000 Ernie’s attorney, Dale Golden, incorporated his publishing and his label as one Company; Colorful Music Baby Blue Records, Inc. (aka CMBBR, Inc.). In 2002 the first CD released on Baby Blue Records was an R&B/Reggae soul song, and a Calypso flavored up-tempo dance tune; My Baby Wears the Lovin’ Crown & Can You Put It to Music? From the earlier Chicago Audio Lock Up recording sessions, and the first release on the new label; a Collector’s Item. In 2004 A philosophical (hip-hop opening rhythm) R&B/Gospel -Christian Rock – Contemporary – 12 songs CD. There is a Way: Inspirational Songs of Faith Hope & Love, another released on Baby Blue Records. It includes the patriotic song “I Love America.” Ernie’s heartfelt response to the 9/11 New York Twin Towers attack! You can also find the Vintage Northern Soul music made available in 2009 – Ernie Hines-The Early Years (the Chess Recording sessions), – Kunta Kinte (The Man) “Remembering Roots” (the PS Recording sessions), and “The Lovin’ Crown” b/w “Put It to Music” Singles Only (Collector’s Item) on Baby Blue Records, CD’s, downloads, etc. and by order also. www.goprotunes.com/84 , www.Amazon.com Ernie Hines Music , www.youtube.com/user/ErnieHines1, www.tunecore.com/music/erniehines, at iTunes, and around the world. In recent years 2011, two songs with biblical and profound meaning, written by Ernie for lovers in all seasons, on any occasion or Holiday; a two-song album – Everlasting Love (The Wedding Song), and Jesus, the Christ Child (Spirit of Christmas) on Baby Blue Records, CD’s, etc. Available now, get your copy. There are at least two more album of original material Ernie hopes to record. Colorful Music Baby Blue Records, Inc. (also known as CMBBR, Inc.). FYI: Earnest has been married three (3) times and is the father of eight (8) children; three girls, five boys, and many grandchildren; and some great grandchildren.